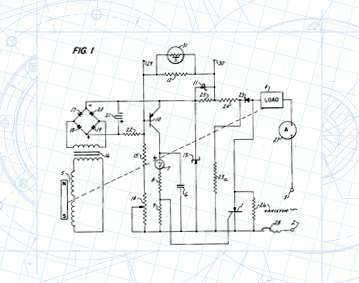 This invention relates to control circuits for vibratory devices and more particularly to circuits were controlling vibratory feeding equipment such as vibratory bins, hoppers and transport rails. The principal object at this invention is to provide an improved circuit for supplying fluctuating current to solenoids which are mechanically coupled to drive the vibratory system. It is a further object of this invention to provide an improved hopper control circuit which will maintain a constant rate of feed parts from the hopper over a wide range of ambient conditions, hopper parameters and parts load. It is a still further object of the present invention to provide an improved control circuit for gaining control current to an actuating device in accordance with the vibratory input to the device being controlled. Other objects will be in part obvious and apart pointed out for any detail hereinafter. The invention accordingly consists of the features of construction, combination of elements and arrangement of parts which will be exemplified in the construction hereafter step in the scope of the application which will be indicated in the appended claims.